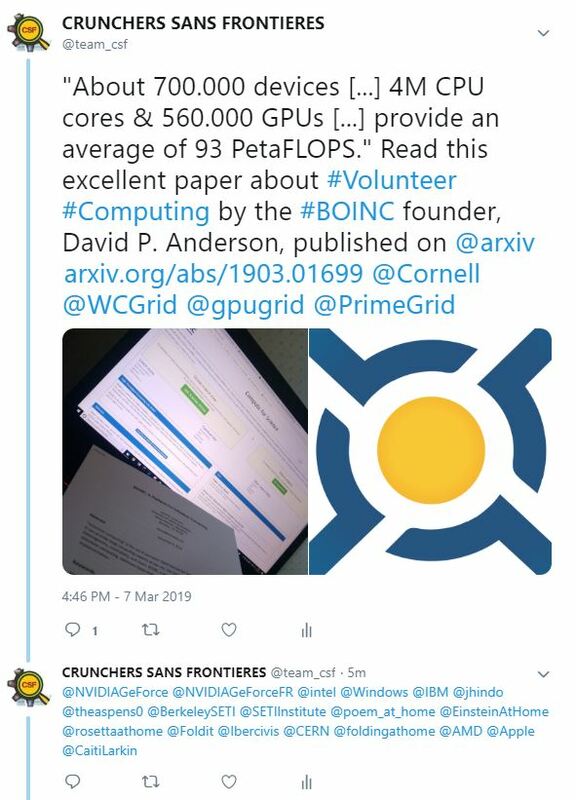 A paper about BOINC has been posted on arXiv.org. Message 90578 - Posted: 6 Mar 2019, 15:38:53 UTC - in response to Message 90571. BOINC allows jobs to be targeted at a particular host or volunteer. This can be used, for example to ensure that test jobs are executed on the project’s own computers. Interesting, presumably CPDN and others could potentially use this to send test units only to certain trusted computers, e.g. those who are part of the testing programme currently hosted seperately when the testing site is down? Message 90581 - Posted: 6 Mar 2019, 16:19:12 UTC - in response to Message 90578. They need it even more for their regular work units that crash when suspended. They could be sent only to the machines that run 24/7, for example. Those machines could be determined by how reliably they return results, or by their own self-selection. I am surprised that it hasn't been implemented by now, given the problems they have.